Tuesday’s rally was the largest protest by charter supporters that L.A. advocates could recall. Their numbers were dwarfed by the tens of thousands of union supporters who marched before and during the six-day teacher strike. But it was a show of force for those who said they had stood by respectfully during the strike but now felt their community and their right to school choice were under attack. Some said they felt sold out by those they called supporters and a backroom deal to end the strike that targeted their schools. The 5-1 vote approved a board resolution calling on state leaders to order a pause on opening new charters in the district while they conduct an eight-to-10-month study of their financial impact. 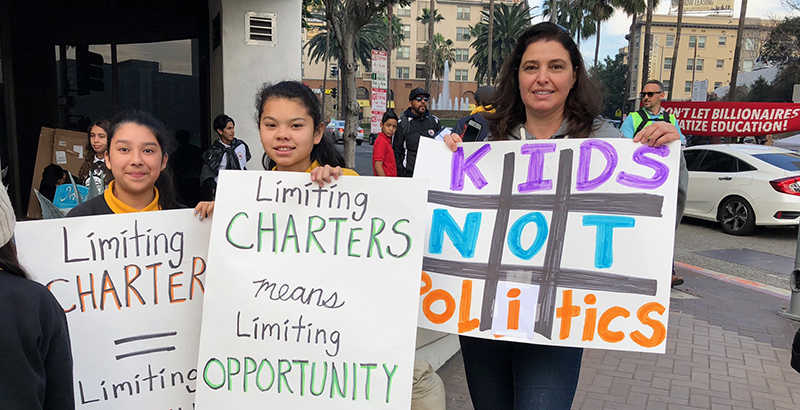 Charter supporters plan a March 13 rally in Sacramento to press legislators and the governor not to impose a moratorium. In the meantime, they expressed confusion over what it means for charter families now. “By supporting this, it doesn’t mean that in L.A. we are going to have a moratorium, that’s not what this means,” board president Mónica García explained a day after the vote. “It’s a communication about an intention about what would be helpful from one particular perspective.” Until Gov. Gavin Newsom acts, nothing has changed in L.A., she said. Myrna Castrejón, CEO of the California Charter Schools Association, also said there is no immediate change. 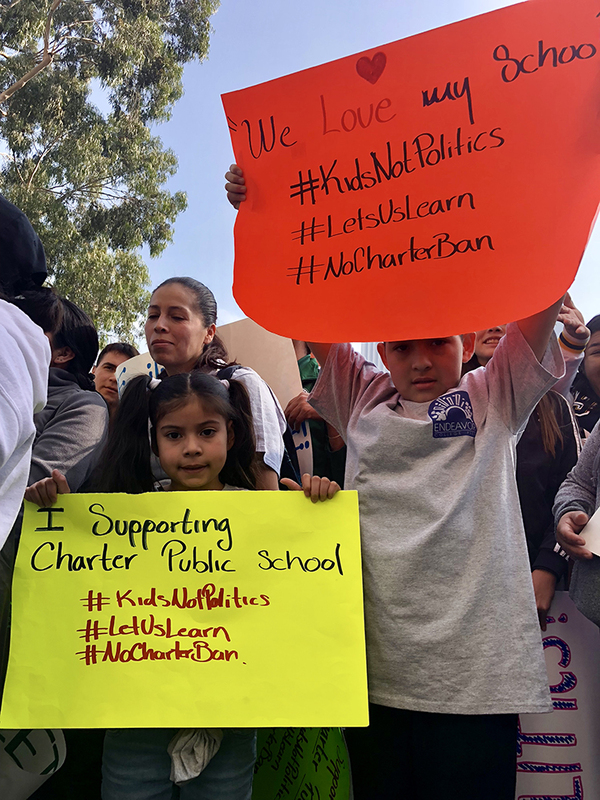 Before the board approved the resolution, charter families gathered in unprecedented numbers: about 3,500 people, according to an estimate by an L.A. School Police officer outside the district’s headquarters. People chanted, “My child, my choice” in English and Spanish as they filled the street, which was closed in both directions as people of all ages streamed in. Students arrived in their uniforms, some with their bands and dance groups. Parents pushing strollers through the crowd managed to hold their little ones’ hands and posters at the same time. Some parents arrived early to line up on the sidewalk outside the boardroom’s entrance so they could get one of the limited slots to speak at public comment. One of them was Roxann Nazario, mother of a fifth-grader at Fenton Avenue Charter School in the San Fernando Valley. Nazario was in tears Tuesday as she addressed the board. Nazario said that she and about eight parents met with Gonez on Monday to ask her to vote no on the resolution. She said Gonez told them that she was inclined to support the resolution only if the board would include language she was going to offer as an amendment. Vladovic forcefully rejected Gonez’s amendment, which failed to win the required four votes. Despite that, she voted to approve Vladovic’s resolution, which he had modified slightly during the meeting. 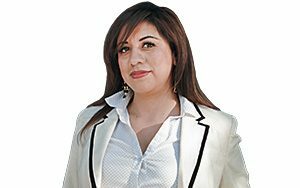 Gonez responded in an email Wednesday to LA School Report that “I was elected to represent all of Board District 6, including families of district schools as well as charter schools. I support options for families, but a key part of governing is compromise. I sought to improve the final resolution, but despite my efforts, the full Board did not accept those changes. “A study of charter schools could help to inform continued policy improvements, and it remains up to the state to decide whether to put a temporary pause in place during that study. If they do, students in existing charter schools will not be impacted,” Gonez added. 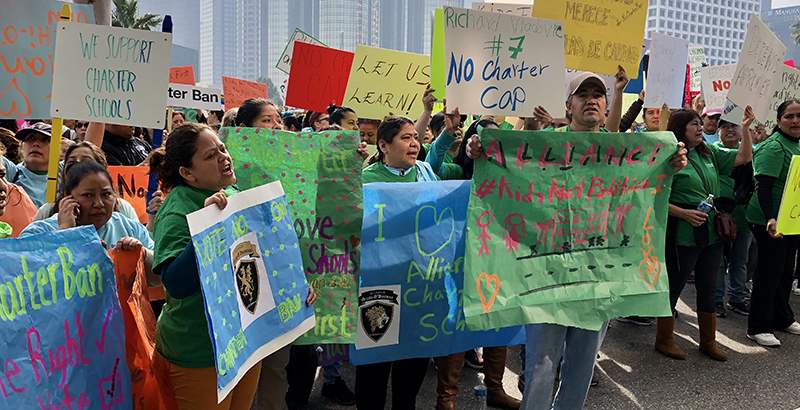 Before the board meeting, García, the board president, had addressed the rally to thank charter supporters for showing up, telling them, “I hear you, I’m with you.” She said Wednesday by phone that she had heard multiple criticisms since the vote. Vladovic cited fewer students enrolling in the district’s 225 independent charter schools as one reason for a moratorium. “The rate of growth is slowing as charter leaders recognize that there is a natural limit to how many schools of any model our student population can sustain,” Gonez said Wednesday. CCSA data show that enrollment in independent charters authorized by L.A. Unified has grown by more than 4,000 students for each of the past three years, from 87,572 in 2013 to 112,333 in 2018. Javier Reyes, CEO and founder of Alta Public Schools, including Academia Moderna and Prepa Tec charter schools in Huntington Park, was at the rally and said all of his schools have waiting lists. Nazario said that in her community in Sylmar there are only two middle schools, and she fears her daughter may have no other option. Gonez said by email Wednesday that the district has approved just four new charters this school year. Next Tuesday’s board meeting is the monthly meeting on charters. No new charter petitions are scheduled for a vote, just one material revision and one renewal petition. More than 80 percent of charter students are non-white and from low-income households, according to CCSA. The crowd outside district headquarters Tuesday was a reflection of that. While families came from all parts of the city, they were overwhelmingly Latino, and a number of them said they were immigrants. 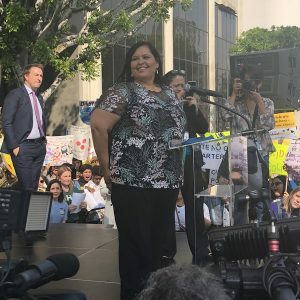 Adela Carmaz, an immigrant from Romania, said her two daughters asked her to join the rally Tuesday to advocate for their school, High Tech Los Angeles in the San Fernando Valley. One is in ninth grade; the other is now at UC Davis. “I grew up in a Communist country where I had no choice for schools, so I want choices for my children. I have nothing against LAUSD. I just want to have a choice for my children. I did have not that in my country — that’s why I’m here,” Carmaz said. “I had to miss work today, but they asked me to be here,” said Carmaz, one of the first parents to arrive outside the district headquarters early Tuesday morning. She said that when she discovered charter schools after her daughters attended district schools in elementary and middle school, she saw a big difference. Magda Ríos emigrated from Guatemala, and her children attend Fenton and Vista Charter. She said charter schools have offered her children access to high-quality education. “For me, as an immigrant, education is major. It’s a possibility for having a better future. That option in my country doesn’t exist,” she said in Spanish. “This is a country of opportunities, so I’m here to ask the board members to please follow their hearts and focus on the kids and families, because while we parents are fighting for a better education for our children, they just care for more money and their politics.” Ríos said. She said she wants the division among parents and the attacks against charters to stop, and a moratorium wouldn’t help. Guadalupe Torres said she joined the rally because she has children in both traditional and charter schools. She said she also supported the teachers in their strike. “It’s not fair that we respected them when they were on strike demanding a better salary and nurses, but they are now attacking our charter schools. My eldest child is in the 10th grade at an excellent charter school, and they should respect that, put their politics away, and respect our choice,” she said in Spanish. Ana Ponce, who founded Camino Nuevo Charter Schools, which serves a large immigrant population, was at Tuesday’s rally. “People here feel they can’t have that choice without charter schools. They believe in public schools; most of them have children attending both schools. We just want good schools for all kids in this city,” said Ponce, who this month started as executive director of Great Public Schools Now, which advocates for more high-quality school options, both charter and district.